Ideal for your next project. This folding utility knife features a rubberized grip for comfort and safety. 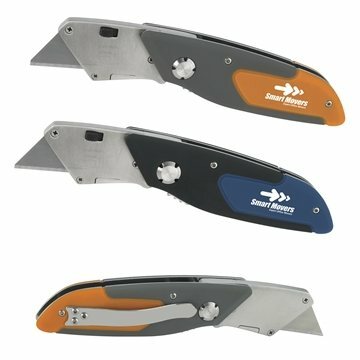 The blade folds out and locks in place to provide ease of use. The quick release blade lock ensures easy blade changes. Soft grip for easier handling. Happy using the product. Bought it for my staff; very well recieved. The color was an excellent choice and very nice. What I liked most was the price for the quality and how well they did on redoing my logo. I am very happy with this item. I place an order for this every year. I never have any problems everything also goes very smoothly. Wouldn't go anywhere else. Pricing and quality was excellent. Received quick turn-around time, also it was done quickly and easily. Color was the great.